Fill out an application for a dog or cat the first week in July and the adoption donation is only $4.00! Create a quiet place. Firecrackers, loud party voices and booming music can make pets anxious. Even well-socialized animals are likely to be pushed beyond their limits. Whether you go out or entertain at home, make sure your pets have a restful room or area to which they can retreat. Don’t take your pets to a fireworks display. Though you might prefer to have your pets’ company, they’ll be happier at home. Secure all potential escape hatches. If you can, leave them in a quiet, sheltered area. To reassure them, you may want to keep a television or radio playing at a normal volume while you’re away. Don’t leave your dogs outside unattended. Even tethered pups will struggle to get away if startled by noise. Dogs who aren’t tethered may try to dig out of an enclosed yard. Generally, if dogs are afraid and stressed, they will look for a way out. Be sure your pets wear current ID tags. Clear identification can be a pet’s ticket back home. An ID tag means anyone who finds your pet can get in touch with you right away. Even an indoor cat should wear a breakaway collar with ID in case he slips out. If you don’t have time to get a tag before the holiday, write your pet’s name and your phone number in indelible ink on the collar itself for each of your pets. Keep all fireworks away from pets. People often don’t realize how unpredictable and dangerous fireworks can be. Bottle rockets and firecrackers, in particular, can fly off in any direction. If one explodes near a pet, it could severely burn or blind him. Hire a pet-sitter. If you go out for the day or evening, hire a pet-sitter to stop by or ask a friend who knows your pets to pay a visit. The loving touch and soothing tones of an animal-lover can calm your pets during the pyrotechnics. This entry was posted on Friday, June 29th, 2012 at 4:59 pm	and is filed under News. We specialize in personal adoptions and placement. Monday to Sunday by appointment only. Monday to Sunday, 9 a.m. - 3 p.m.
Monday to Friday, 11 a.m. - 4 p.m., Saturday and Sunday, 11 a.m. - 3 p.m. 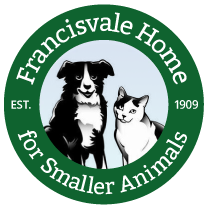 Copyright © 2019 Francisvale Home for Smaller Animals. All rights reserved.